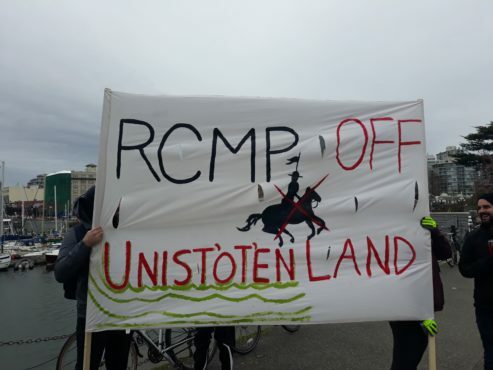 Groups assembled across Canada a few weeks ago to protest the RCMP’s raid on Unist’ot’en land. Photo by Anna Dodd, Editor-in-Chief. What is happening on Unist’ot’en territory is not just about pipelines and fossil fuels. It is about how Canada continues to infringe upon and undermine the sovereignty and homelands of Indigenous peoples. Because this is a watershed moment in Canada, I will share some important updates, details and history regarding this issue. Despite claims to the contrary, the Unist’ot’en and the overall Wet’suwet’en Nation remain steadfast in their opposition to this project. The Wet’suwet’en Nation is composed of five clans: the Gilseyhu (Big Frog clan), the Laksilyu (Little Frog clan), the Gitdumt’en (Wolf clan), the Laksamshu (Fireweed clan), and the Tsayu (Beaver clan). Within each clan are Houses that independently manage their Yintah (territory) through their respective Hereditary Chiefs. In total, there are 13 Houses within the five clans. The Unist’ot’en are a House within the Gilseyhu clan. While an agreement did take place on the morning of Jan. 11, it did not involve consent being given to the Coastal GasLink project. In a statement by the Unist’ot’en, it was revealed that the Hereditary Chiefs allowed the removal of a gate bordering their Yintah, on account of the very real risk of serious injury or death that would accompany another raid by the RCMP. One of the many duties of a Hereditary Chief is to ensure the safety of all those who defend Wet’suwet’en Yintah. For the Wet’suwet’en, this event is only the latest of countless injustices committed against the Hereditary Chiefs and Wet’suwet’en Yintah. Even within the context of Canadian law, what happened days earlier, on Jan. 7, remains questionable. Enforcing an injunction issued by the B.C. Supreme Court, RCMP personnel, militarized with assault rifles and body armour, invaded the territory of the Gitdumt’en. Behind a barricade constructed from 2x4s and barbed wire, unarmed Wet’suwet’en people demanded that the approaching RCMP receive the consent of the Hereditary Chiefs before entering their Yintah. Their pleas were ignored as RCMP personnel started dismantling the barricade, climbing overtop, and forcibly arresting anyone attempting to maintain the Gitdumt’en checkpoint. All the while, painful screams could be heard from people who had strategically placed their arms within the barricade, hoping to dissuade such a forceful entry. 14 people were forcibly removed from Gitdumt’en Yintah that day, violating Article 10 of the United Nations Declaration on the Rights of Indigenous Peoples (UNDRIP). For the Wet’suwet’en, this event is only the latest of countless injustices committed against the Hereditary Chiefs and Wet’suwet’en Yintah. In 1876, the Indian Act was introduced, which consolidated numerous pre-existing colonial ordinances aimed at eradicating Indigenous cultures and governments. Beginning in the 1880s, Gitxsan and Wet’suwet’en Hereditary Chiefs, becoming increasingly adept within the colonial legal system, began lobbying the Canadian government for remedy regarding infringements of their territories and laws by settlers and colonial institutions. As Hereditary Chiefs in B.C. continued to mobilize within the Canadian legal system, amendments were made to the Indian Act that would essentially criminalize anyone who participated within Indigenous forms of governance, such as the Potlatch Ban from 1880-1951. Still, the Hereditary Chiefs continued to contest the Indian Act, Indian reserves, and the imposed band council governance model. As a result of persistent political organizing and efforts to redress issues of territory and authority, the Indian Act was amended again in 1927, making it illegal for Indigenous peoples to raise legal funds, hire lawyers, or seek legal counsel regarding land claims or aboriginal title. Generations later In 1987, Gisday’wa, a Wet’suwet’en Hereditary Chief of the Gitdumt’en, testified before the Supreme Court of British Columbia in Delgamuukw v. The Queen (or Delgamuukw v. British Columbia), which would become recognized as a groundbreaking case at its conclusion in 1997. If we truly seek justice, the Canadian state must confront a moral, intellectual, and legal deficiency that has for centuries characterized its relationships with Indigenous peoples. By extension, this is also the duty of the University of Victoria, whose silence regarding the injustices on Unist’ot’en Yintah would only be interpreted as upholding the status quo. Gitxsan and Wet’suwet’en title to their lands had never been extinguished by the province of British Columbia, and for the Gitxsan and Wet’suwet’en nations, the Hereditary Chiefs are the rightful decision-makers on their respective territories. Both of these points were vehemently contested and eventually conceded by B.C.’s lawyers in Canada’s Supreme Court. While Aboriginal title is affirmed in the Supreme Court of Canada and the Canadian Constitution (Section 35), it has yet to be fully defined and given legal weight. To this day, it remains so ambiguous that courts cannot take it into account when issuing injunctions such as those issued against the Unist’ot’en and the Gitdumd’en. The Wet’suwet’en people opposing Coastal GasLink are simply treated as trespassers in their homeland. The five clans of the Wet’suwet’en unanimously oppose this project. 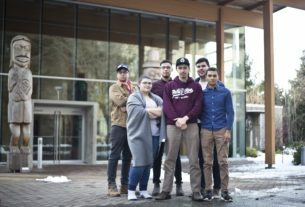 The Hereditary Chiefs continue to be resilient in upholding Wet’suwet’en law despite a century of prosecution and exploitation on their Yintah. Band Councils, dependant on Federal funding in order to provide services to reserves, were imposed alongside harmful legislation that seeked to disrupt Indigenous governance systems. If British Columbia and Coastal GasLink are willing to undermine resilient Indigenous governments by making deals with Indian Act band councils, is that reconciliation or assimilation? In an era of “reconciliation” and “nation to nation” relationships, Indigenous peoples’ rights, values and governance systems continue to be repressed. If we truly seek justice, the Canadian state must confront a moral, intellectual, and legal deficiency that has for centuries characterized its relationships with Indigenous peoples. By extension, this is also the duty of the University of Victoria, whose silence regarding the injustices on Unist’ot’en Yintah would only be interpreted as upholding the status quo. 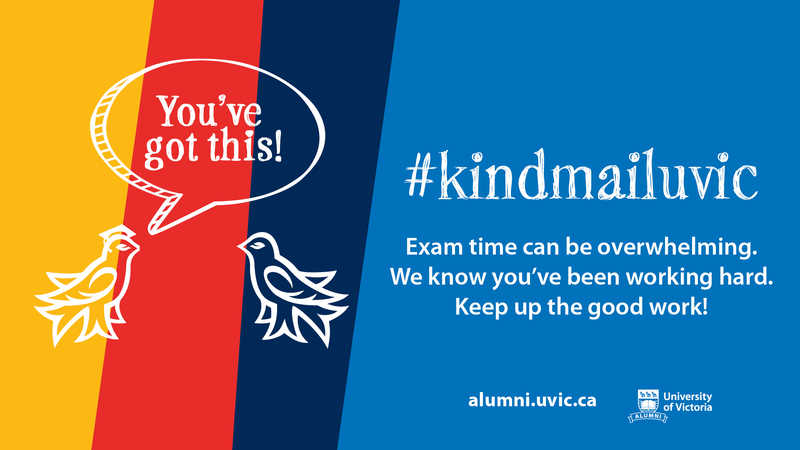 By Kolin Sutherland-Wilson, Firekeeper of the Native Students’ Union.